The Styrka S7 2.5-15x50mm rifle scope is a feature-packed option that could provide budget-strapped departments a viable police sniper scope for nearly half the cost of many competitors. 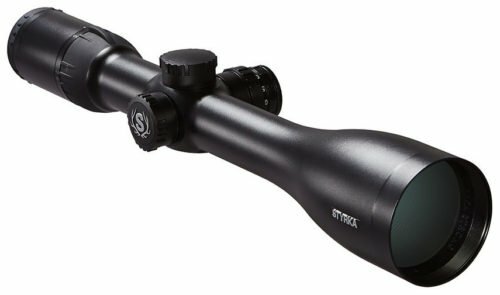 Styrka scopes may not be as well-known to law enforcement shooters, but are gaining recognition by hunters for their clarity, durability and accuracy. Styrka means “strong” in Swedish, and the limited exposure I’ve had to these S7 scopes they appear to be worthy of their namesake. Styrka is rather new to the scope and optic market, really coming into the public eye in 2015. However, when they entered the market they came prepared to jump in with some outstanding scopes and binoculars. Since their entry they have wasted no time and are no offering upgrades to their original scopes, while adding reflex red dot optics and variable magnification reflex optics as well. The Styrka S7 series offer the most advanced features from Styrka. Styrka is based in Eagan, Minnesota and though they are new enough to still have some mystery around the quality of their products, I have seen some very positive reviews from hunters and reputable publications, including the NRA’s American Hunter Magazine that did a review on a Styrka binoculars. 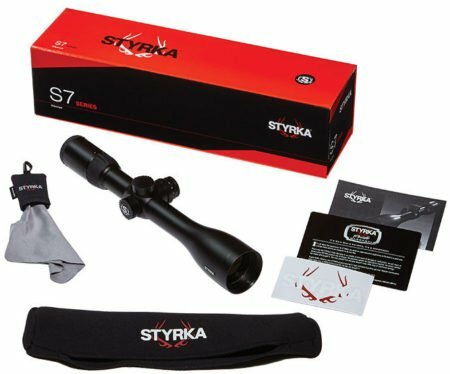 Styrka S7 scopes are the company’s best. Styrka as three divisions of rifle scopes and binoculars; the S3, S5, and S7 series. The S7 series is the company’s premier line to date, and are made from aircraft-grade aluminum tubes. 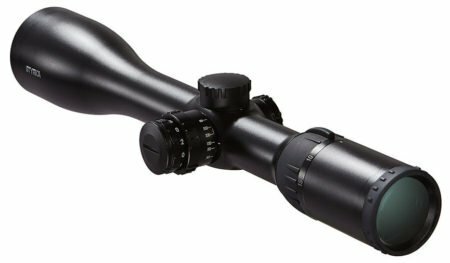 Where the S3 and S5 series of rifle scopes use a 1″ tube, the S7 series of scopes uses the larger 30mm tube for even greater light transference. This is the reason I chose to focus this post on the S7 scopes, because I firmly believe the larger 30mm tubes provide a greater opportunity for optical clarity from simply having more light drawn in. Styrka uses ED lenses that are multi-coated for clarity. Styrka not only coats their lenses, they use enhanced lenses themselves. Instead of traditional optic glass, Styrka uses ED lenses. The ED, or “extra-low dispersion” lenses are denser and reduce the potential for chromatic aberration, which is the inability of the lens to focus the dispersion of light wavelengths onto a single point. Chromatic Aberation can cause high contrast objects to appear blurry, or be surrounded by colored edges. Styrka ED lenses prevent this and provide superior clarity on the objects being focused upon. 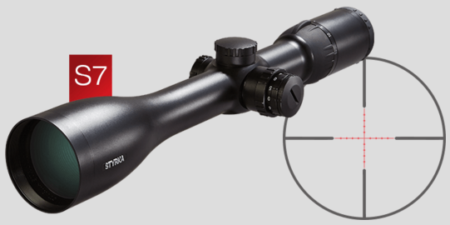 Styrka S7 series scopes are packed with features. Parallax adjustments are completed by a side mounted turret. This allows shooters to make quick parallax adjustments while maintaining their master shooting position. This is incredibly important to law enforcement shooters, due to the likelihood of having to transition from targets at various ranges. Parallax is a blurring of focus as the shooter attempts to view objects at various ranges. An adjustment turret provides the quickest and easiest method to refocus the shooter’s view. 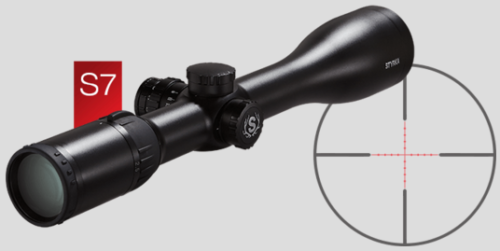 Certain S7 series scopes have an illuminated reticle, like the S7 2.5-15×50 mil-dot option. 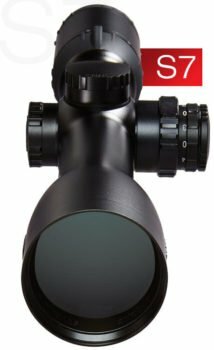 This allows for quick acquisition of the reticle in low-light conditions, which can be particular beneficial in law enforcement applications. 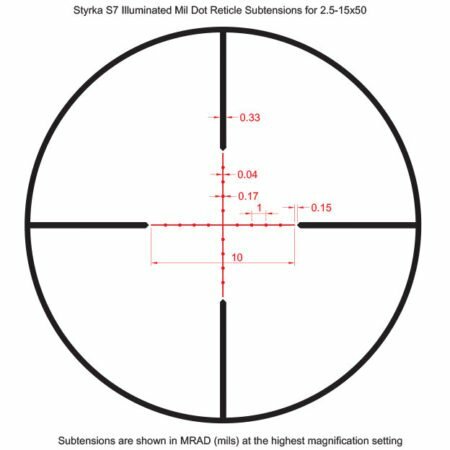 The Styrka Mil-Dot scope comes with an illuminated reticle, and pre-set hold-overs. Elevation and windage adjustments are made from exposed turrets with 0.25 MOA adjustments, and a range of 60 MOA. Exposed turrets provide the best means for quick zero adjustments. Each turret is designed with a Rugged Erector Tube System. This system consists of precision machined premium brass to help maintain critical accuracy and point-of-impact in extreme shooting situations. Having the assurance that expected bumps and jostling will not cause turret settings to change is imperative for a law enforcement sniper. Exposed turrets are better for law enforcement sniper rifles. Each S7 scope comes with a Spudz micro-fiber cleaning cloth, neoprene scope cover, and Styrka magnet and sticker. As an active law enforcement sniper I take my posts on optics very seriously. Quality glass is perhaps the most important feature of a sniper rifle. I say this because a quality scope can help a mediocre rifle shoot well, where a cheap scope can cause a high-dollar rifle shoot very poorly. While at SHOT Show I briefly perused the Styrka booth, and was intrigued by the products I saw. With a busy schedule and limited availability I did not spend much time on a company I was unfamiliar with. Now that I have seen, read, and studied more on Styrka I wish I had. They will definitely be on my 2017 visit list. However, without spending time looking through their scopes, shooting with them, and seeing them put through the rigors of field work I cannot endorse their use as a law enforcement sniper rifle scope at this time. Despite my hesitations, Styrka should not be discarded off-hand, but should instead be examined very thoroughly by prospective law enforcement buyers. If possible, agencies should try to test and evaluate Styrka scopes as an option. At a lower cost than many well-known competitors, and with a magnification range not offered by many, Styrka could be an outstanding and affordable option.